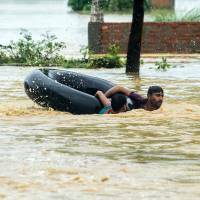 MADHYAMANCHAL, NEPAL - At least 165 people have died and thousands have fled their homes as monsoon floods swept across Nepal, India and Bangladesh, officials said Monday, warning the toll could rise as the extent of the damage becomes clear. Three days of relentless downpours sparked flash floods and landslides that have killed at least 70 people in Nepal, 73 across northern and eastern India and 22 in Bangladesh. Around 200,000 people are living in emergency camps in Assam in northeast India, which suffers frequent flooding during the annual monsoon rains. Another 15,000 have had to leave their homes in the eastern state of Bihar, which borders Nepal and where one official said seven rivers were at danger levels. Huge swaths of the state were submerged in 2008 when a river burst its banks across the border in Nepal, with the two countries trading blame for the disaster. In Nepal, police said over 48,000 homes have been totally submerged by the floods. As emergency workers struggled to reach far-flung areas, the country’s home ministry said another 47 people were missing, presumed dead. The Nepal Red Cross warned that shortages of drinking water and food could create a humanitarian crisis in the impoverished Himalayan country. “In many parts of the country there is a scarcity of safe drinking water creating a high risk of health hazards,” spokesman Dibya Raj Poudel told AFP. 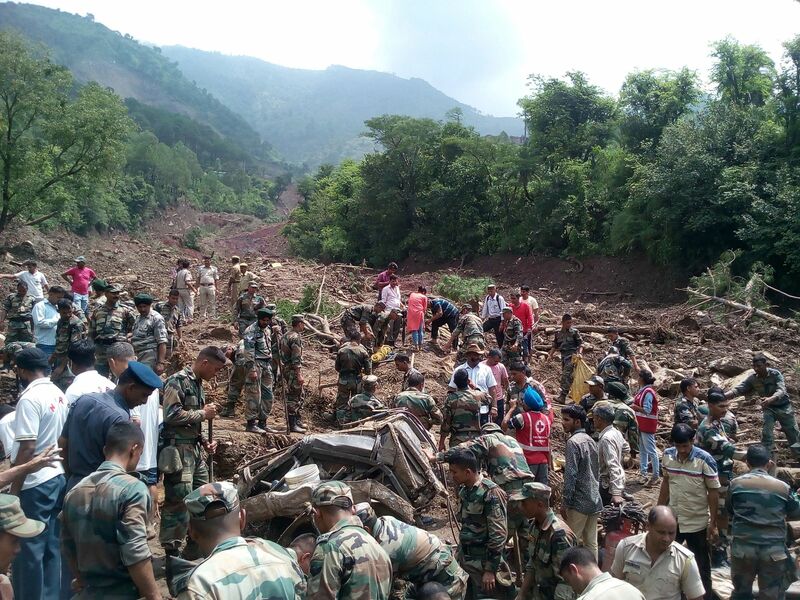 In India, emergency workers were scouring the area hit by a massive landslide that swept two passenger buses into a deep gorge on Sunday, killing at least 46 people in the mountainous northern state of Himachal Pradesh. 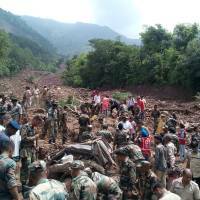 In the neighbouring state of Uttarakhand — which also borders Nepal — three people were killed in a landslide late Sunday triggered by heavy rains, local police official Ajay Joshi told AFP. Bangladesh deployed troops to shore up embankments in the north of the country, where flooding has killed 22 people. Local government administrator Kazi Hasan Ahmed told AFP up to 700,000 people had been marooned by flood waters after rivers burst their banks following days of heavy rain. “We’ve not seen such severe floods in Dinajpur since 1988,” he said, referring to the worst-hit district. The government’s Flood Forecasting and Warning Centre warned that water levels in some major rivers would continue to rise over the next 72 hours, raising fears the flooding could spread. In Nepal, the worst of the flooding was in the southern lowlands known as the Terai, the country’s most fertile region and home to much of its agriculture. “We are getting reports that about 70 percent of agriculture area in the Tarai is inundated,” said Shankar Sapkota, senior agricultural economist with the government. Nearly 150 people have been killed in Nepal since the beginning of the rainy season in late June. The rains are now expected to shift westwards and authorities in Nepal have begun evacuating 74,000 people from the area expected to be hit. 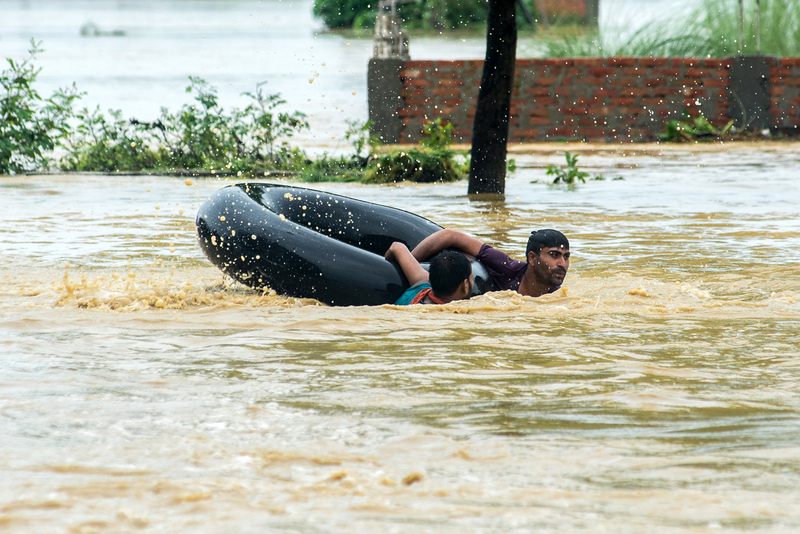 Hundreds have died in torrential rain, floods and landslides in neighbouring India during the monsoon, which hits the country’s southern tip in early June and sweeps across the nation, lasting into September.